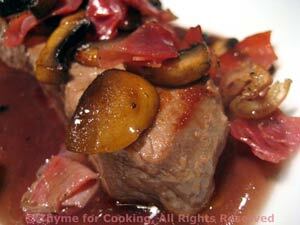 Thyme for Cooking Filet Mignon with Marchand de Vin Sauce. This sauce in lovely with filet mignon, but use any tender steak that you like. Use a hot skillet or grill pan to cook quickly, adjusting time for desired degree of doneness. The sauce is simple, but intensely flavorful... And easier than the original. Clean mushrooms, reserve 6 - 7 caps for garnish. Finely chop shallots, garlic, remaining mushrooms and stems, 2 slices of Prosciutto. Put it all into a saucepan, add red wine and beef stock. Bring to a boil, reduce heat and keep at a hard simmer for 20 minutes. It should reduce by about 1/2. Return sauce to pan and bring back to a boil. Add cornstarch mixture to sauce, stirring constantly until thickened and clear. Keep warm while you cook the steaks. Slice reserved mushroom caps and 1 slice Prosciutto. Heat oil in nonstick skillet over medium-high heat. Add mushrooms, Prosciutto, and sauté until browned, 3 - 4 minutes. Sauté beef 2 minutes per side for rare, (3 for medium rare) and remove. Adjust time for thicker or thinner steaks and remember: you can always put it back if it's not done enough. Spoon some sauce onto 2 plates. Place steaks on top and garnish with ham and mushrooms.